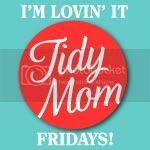 I can't believe I finally figured out how to do a collage (Thanks to a great tutorial by Cheryl of Tidymom contributing on Beautiful Blog Designs), and retrieve it! It proves that you can teach an old grandma new tricks! Ha ha! Unfortunately, I didn't have a cute model available as I did here for my mustache cookies. I grabbed my resident Pooh, but he looks a little bit creepy, so I reluctantly resorted to myself (not much better:)) to show you the LolliLips cookie in "action". 1. Trace and cut out the template on card stock (I actually used a file folder). You can also use thin cardboard or a stencil sheet. 3. Once on the baking sheet, insert the sticks into the bottom, center of each cookie, about halfway. I have inserted them after they are baked when they are still soft, but I prefer it before, and haven't had any problems. 4. After they are baked, let them cool for a bit on the baking sheet, and then transfer to a cooking rack with a spatula, not by the stick. You want to make sure it is completely cool and set before you pick it up by the stick. 5. Once cooled, decorate with the royal icing...outline, fill in, add details. 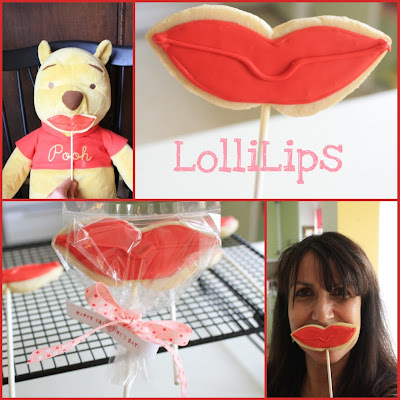 Let icing dry for a bit between each step, especially before you add the lip detail. Have FUN with your LolliLips! This post is also linked to Allison's SWEET TOOTH FRIDAY! How adorable is THIS? I love it! You look super cute - so does pooh! Haha, those are some fun and funny cookies! I was thinking about you the other day. I was thinking, Sue must have SOOOOO many cookie cutters! Glad you figured out how to save your collage, good job! Sue, they are super-cute! I love collages, they make posting fun :) Love the LIPS!!! What a cute idea! I would hold them against my lips and grin too. LOVE these too! So cute and clever!!! Good job on the collage!!! Hi Sue-You make THE cutest cookies ever. LOVE the lollilips!!!Gorgeous! ^^ They are super cute! such a great idea! I think you have a future in the modeling department! Another fantastic cookie and great tutorial. I just realized, I have probably 50 to 60 cookie cutters, of all sizes, but no lips! Can you believe that? I have a palm tree, a musical note, an elephant, but no lips..lol Now I have a reason to get some, lollilips! Such an adorable idea, Sue! They look totally awesome. I should give these a try. you are inspiring me more and more. Too cute! Perfect for Valentine's. My kids would enjoy making these. thanks for visiting my blog, I'm jealous of your cranberry stockpile! Oh Sue you are just the cutest thing in those lips ;p. Love your adorable ideas always. Cute cute cute! And fun! Omgosh the kids would love these in in Clara's class. These are adorable! Thanks for sharing the tutorial. These may just be the cutest Valentine cookies I've seen yet! CUTEST COOKIES ON THE BLOCK! Everything you do just blows me away. I adore these. My granddaughter came and told me she needed heart cookies for Valentines at school, but I bet we could sneak in a few of these, way too fun. Oh my gosh - How adorable! These look like a lot of fun to make. These are so cool...I must make them for my little ones. They're so cute! This would be a great treat for this Valentines. Doing this would certainly be fun. They're so cutee! and you look great! Your lollilips are adorable. And you're a great model! Thanks for the link; I'll be sure to check it out. those are awesome! and they look delicious! These are adorable! They really bring a smile to your face. You are fun! Your cookies are too. Pooh Bear looks extremely cute with his new lips. Ha ha ha these are so cute and so much fun!